Love tracking your fitness with your fitness tracker? Can get enough handy graphics visualizing your every move? What about the data generating that information? Who owns it? How private is it? 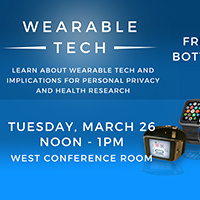 This presentation will focus on the privacy concerns related to individual fitness trackers and wearable technology. Implications for the use of fitness trackers in health research will also be considered. Join us on Tuesday, March 26 from Noon to 1pm in the West Conference Room. Free pizza and bottled water served!